The Hebron offshore oil production platform in Trinity Bay awaiting tow out to the Grand Banks of Newfoundland. Photo by Greg Locke © 2017 . St. John’s, Newfoundland — While Canada’s oil sands projects and the North America fracking companies are under scrutiny and financial distress, Newfoundland prepares to bring its fourth major offshore oil project online. The Hebron oil field is located on the Grand Banks of Newfoundland, about 350km south of St. John’s. It’s near three other oil producing fields at Hibernia, White Rose and Terra Nova. 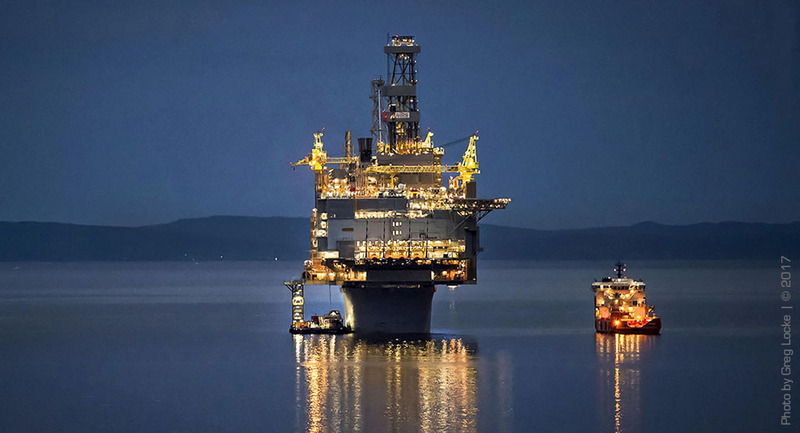 The tow-out comes 20 years to the week that the Hibernia production platform, an engineering marvel of its time, was launched out of the same yard to kick off Newfoundland’s oil boom. At the time, Hibernia was considering a boondoggle, and required federal government assistance to complete. In the twenty years since the government of Canada has earned billions from its 8 percent equity stake, and it continues to be a cash cow for partner oil companies. The Hebron field was discovered in the 1980s with the exploration drilling of the Ben Nevis well, I-45, by Chevron. It will be operated by a consortium (Chevron, Statoil, Suncor, Nalcor), and led by ExxonMobil. It holds an estimated 700 billion barrels of oil, but like the three other projects, it will most likely yield much more once production begins and advanced drilling techniques are used to explore the reservoir further. The Newfoundland government has an ownership stake through its energy crown corporation NALCOR, and expects to make $10 billion over the life of the project for the province. The rig cost an estimated $14 billion to construct. It is capable of pumping 150,000 barrels per day. First oil is expected by the end of 2017. Even with the $14 billion price tag, and billions more to operate over its expected thirty year lifespan, the return on investment and rewards for the oil companies and governments in revenue, royalties, taxes and jobs are significant. After the collapse of the inshore fishing industry, forestry and mining industries in the province, and income from oil, kept the Newfoundland government afloat in recent years. With this project completed local politicians, business and trade unions are asking, whats next? 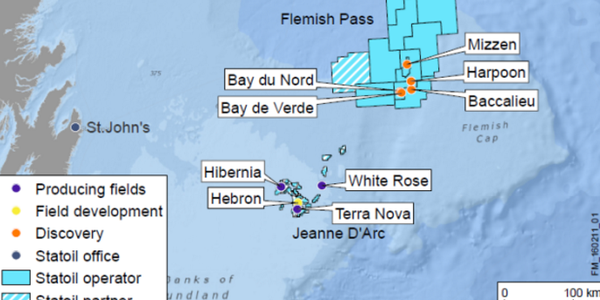 They’re looking to positive exploration results at sites in the Flemish Pass, 400km east of St John’s, by Norwegian oil company Statoil. It is remote, in deep water, in the harsh environment of the North Atlantic ocean with all the increased costs to operate. The question becomes, at what point does it stop being financially viable to build multi-billion dollar concrete and steel islands to recover oil from the earth? For the moment, it’s apparently much cheaper and has less environment impact than the Alberta oil sands projects in western Canada. Hibernia: Exploration drilling began in the 1960s in the Jeanne d’Arc Basin on the Grand Banks of Newfoundland in the north west Atlantic off the east coast of Canada. The drilling of well Hibernia P-51 in 1979 confirmed that there was viable oil reserves deep under the ocean. It would be nearly 20 more years for the deals to be made that would see the construction of a massive concrete production platform and the oil and money to flow as the first offshore oil production project in Canada. The Hibernia offshore oil field is owned jointly by ExxonMobil Canada, Chevron Canada Resources, Suncor, Canada Hibernia Holding Corporation, Murphy Oil and StatoilHydro Canada Ltd.
Terra Nova: The Terra Nova oil field (left) was discovered and developed by Canada’s state owned oil company, Petro Canada. Discovered in 1984, the oil field was the second to be developed on the Grand Banks of Newfoundland. Production from the field began in 2002. Petro Canada was later privatized and purchased by Suncor Energy. 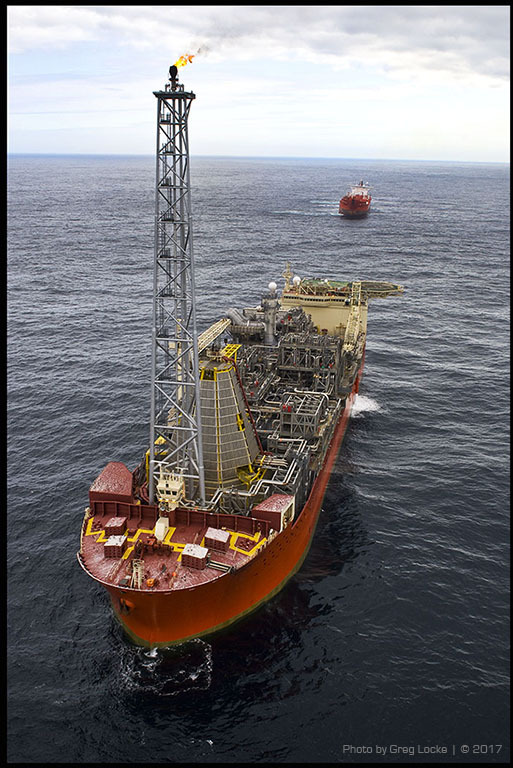 Terra Nova utilizes a floating production platform instead of the concrete gravity based structure of Hibernia or Hebron. Partners in the project are Suncor, ExxonMobil, Statoil, Husky Energy, Murphy Oil, Mosbacher and Chevron. White Rose: White Rose (left) was the third offshore oil field to be developed offshore Newfoundland. Discovered in 1984 and developed by Husky Energy it is the smallest of the four producing fields with Husky as the major share holder and Suncor Energy with a 27 percent stake. It also uses a floating production platform named the Sea Rose. 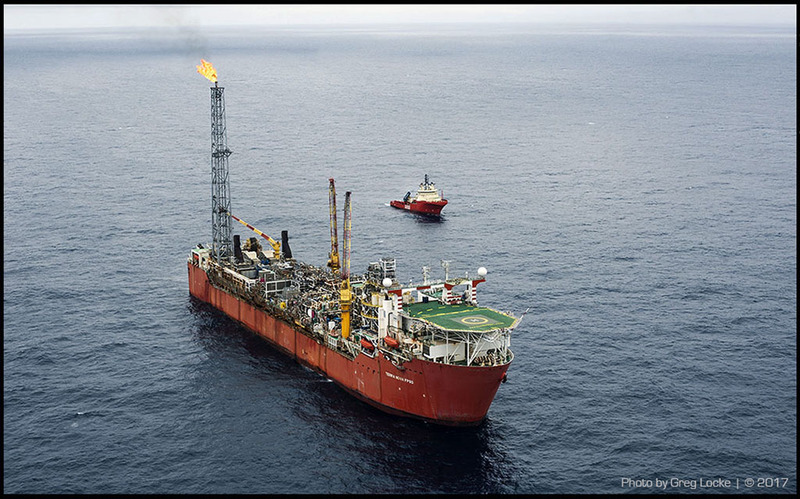 Hibernia, Terra Nova and White Rose have all produced more oil than originally projected and have all more than recovered their development and exploration cost which make them very cost effective and profitable to operate and expand for their owners. Due to advanced drilling and subsea engineering technologies, all are undergoing expansion projects to further extend the lives of their respective projects well past their original life expectancy. Hebron is starting out with projections even larger than the three previous projects and with a 30 year life expectancy. 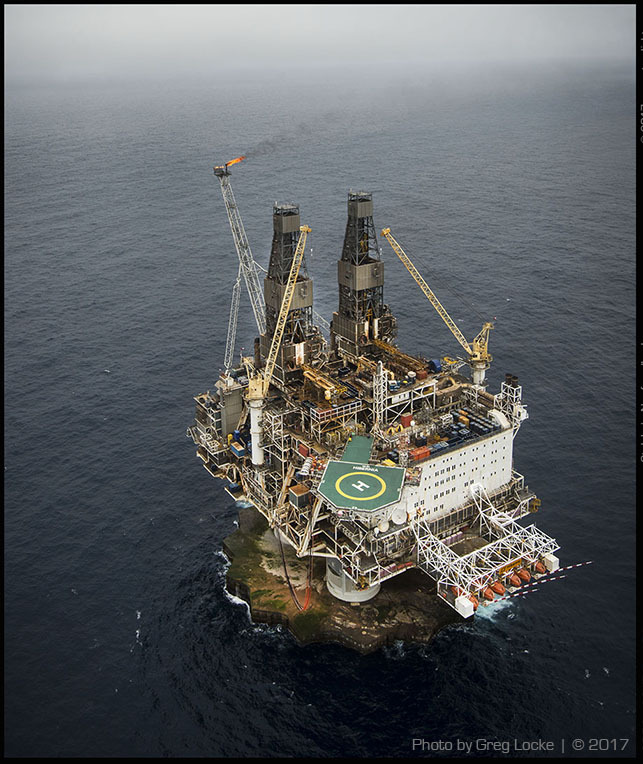 Hibernia was only expected to be producing for 25 years but is still going strong and expanding into the new Hibernia South oil field without needing an additional production rig. I have been covering the offshore oil industry as a journalist and photographer since the early freewheeling and heady exploration days of the late 1970s. It’s been a fascinating and great learning experience to see an entire industry evolve, develop and mature in the political and economic microcosm that is Newfoundland. But like so much in the oil and energy industries the future is not that clear. © 2017 Greg Locke. All rights reserved.